First Nerve: ISDP: How low can you go? There’s a big harvest moon hanging over New Jersey at the moment, throwing just enough light into the belfrey to illuminate the grimy calendar from that Chinese take-out place that gave us the trots a while ago. And whaddya know, it’s the thirteenth of the month. Time for another installment of the FN feature that dares, nay, compels you to peek through your fingers and read every gruesome item. We are talking, of course, about I Smell Dead People, the unaccountable popularity of which drives about 98% of our traffic. We regularly spotlight nominees for the annual Norman Bates Award, given to the person who manages to live at length in close proximity to the stench of a decomposing corpse. Last week’s story by David Owens and Christine Dempsey in The Hartford Courant opens an entirely new dimension of Batesian misbehavior: people who rob the rotting dead. While the body of Debra Jurasus moldered in a recliner in her Goodrich Street home, some people from the neighborhood broke in, ransacked the house and stole a jar of coins, credit cards, a laptop computer, a camera and her car keys, police say. as sitting in a recliner and being covered with flies and other insects. One said that the odor made him sick and that he went outside to throw up, but then went back in to search for valuables. Oh, the poor sensitive soul. Meanwhile, the body of Mrs. Jurasus was described as partially mummified, but with no obvious signs of trauma. How long Jurasus was dead remains unclear. Neighbors said that they had called police about an acrid stench and an unusual number of flies in May, but that police didn’t go into the house. Neighbors said they hadn’t seen Jurasus since February. Hartford doesn't sound like the most tightly knit of communities . . . In Jacksonville, Florida, last month, two bodies were found in a wooded area in the Mixon Town district, near the Prime Osborn Convention Center. According to officers, neighbors contacted police about a foul odor in the area and they arrived just before 7 p.m. to find the bodies, one male and one female. After smelling a foul odor, a citizen discovered the body in a drainage ditch at the intersection of Bonnie View and Scenic View drives in a neighborhood off Sparkman Drive near the Pulaski Pike intersection. 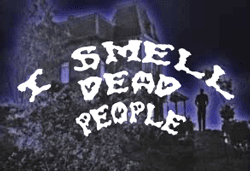 Finally, we are sorry to conclude that the town of Willoughby Hills, Ohio, does not qualify for a peg on the I Smell Dead People Interactive Map. The headline “Willoughby Hills woman found dead, police look for husband,” is promising enough, but the subhead—“Wellness check by police leads to foul odor”—gives the game away. The foul odor has to lead to the discovery; if the search is set in motion by non-olfactory suspicions, then no peg on the map. Sorry, folks, but the rules are the rules.